This summer will be different from many of those in the past. This will be the first summer in some four decades that I have not announced auto races. Over the years I have announced two to three nights a week. In recent years, though, I’ve worked only on Friday nights at Davenport Speedway. But in January I informed the man who promotes the races there, Bob Wagener, that I was retiring. It was a difficult, bittersweet decision. Announcing races has been a large part of my life and a part-time job I really enjoyed. Heck, I’ve done it for so long that in some families I’m announcing for their third-generation of drivers. But that wasn’t meant to be. Bob had his publicist, Mike McGuire, put out a news release. “When the stock cars take to local tracks for the 2015 season, it won’t sound the same,” was his opening line. Some health issues, beginning with a torn cartilage in a knee a year ago that had me hobbling around for two months, caused me to first think about retiring. A good friend, Dan Felsen, who is a few years my senior, put it something like this: When you are young, you believe your good health is going to last forever. But as you get older, you realize you’re not bulletproof. Trips I have been putting off are another reason for the retirement. My wife Sherry and I like to travel and have taken some nice trips, but more remain on our bucket list. The best time to travel, of course, is during the good weather months. Those are the same months racing is taking place. I decided it’s time to stop putting off those trips. I grew up near Davenport Speedway at the Mississippi Valley Fairgrounds and have been a racing fan all my life. My teenage buddies and I all gathered on Friday nights on the top row of the west bleachers to cheer for our favorite drivers. Some of those young friends, most notably Gary Webb, would go on to become drivers themselves. I, on the other hand, wanted most to become an announcer like my role model, Paul Liebbe. Other than working on a stock car pit crew during my high school years in the late 1960s, my involvement in racing began in 1973, when I took over from Liebbe as host of the “Around the Track” motor racing news program on KWNT-AM radio. I kept the program alive on that and other area stations through the 1990 season. In 1973 or 1974 I began substituting for then Davenport Speedway announcer Roger Meier when he had other commitments. From 1976 through about 1978, I also announced special events in Illinois, Wisconsin and Florida for former driver Bill Schwader, who had entered the race promotion business. 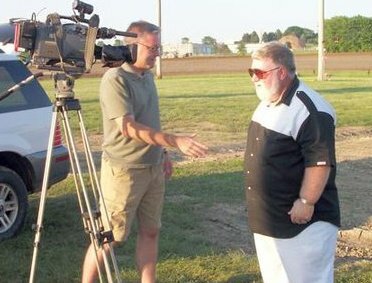 Promoter Ernie Cook hired me for my first weekly announcer job at his speedway in Maquoketa part way into the 1977 season. His announcer, he told me, had gotten angry about something and had abruptly quit. Ernie asked me to fill in until his announcer cooled off and returned, which he guessed would be several weeks. I was there for three years during that, the first of several stints at the track. During my announcing career and in addition to my full-time jobs, I made time, often with the assistance of my wife, to serve as the publicist for two Midwest-based, late-model, dirt track touring series: the NASCAR Busch (and later O’Reilly Auto Parts) All-Star Series (1990-2001) and the World Dirt Racing League’s Polydome Super Series (2002-2009). Sherry and I traveled with the All-Star Series, and I announced some of the series races in places like South Dakota and Tennessee. I generally worked from home when I was with the World Dirt Racing League. In addition, I wrote freelance articles about racing and racers in a number of local and national magazines over the years. But weekly race announcing was my first love, and I’ve announced races at most every track in eastern Iowa and western Illinois over the last four decades. In doing so, I’ve tried to be supportive of the sport and racing people. My philosophy has been that a racing announcer is like a combined football play-by-play announcer and color commentator. You need to tell people what’s going on and you also need to do analysis. You do that by studying the sport and paying attention to its competitors. I reminded them that racing looks easy, but it’s not. I’ve driven a few times and can attest to that firsthand. My commentary has angered some people now and then. That’s to be expected. But I guess I did OK overall. I wasn’t in the business to win awards but have been honored to have done so a few times. In 2001, I was awarded the Racing OSCAR (Outstanding Support and Contribution to Auto Racing) from Quad Cities Racing Connection magazine. In 2010, I won the Tod Brinkman Memorial Award for outstanding support of auto racing, and in 2011 I won the Speedway Fire Rescue Presidential Award for outstanding support of that group of volunteers, to which my wife and I are honorary members. While my involvement in auto racing over the years has been a lot of work, it’s truly been a labor of love. And the dollars I’ve earned doing a job I loved paid for things like family vacations. But what I will miss most about retiring from announcing is not seeing my racing friends quite as often. From drivers to participants to officials to sponsors and fans, racing people are the absolute best. They are highly competitive, but if you need it they’ll give you the shirt off their backs. I can’t tell you how many times I’ve seen drivers loan parts — including engines— to those who need them to compete against those making the loan. Since my announced retirement, I have been overwhelmed by the kind things that many people have said to me. That includes promoter Bob Wagener. “I could always count on your guidance and knowledge to keep me in the right direction, and you were always an important part of the very best team officiating races — your presence will always be missed,” he wrote in an email. “One thing we will have is all the wonderful stories and memories we have accumulated over the years, and know that your name will come up often in a positive light every time I share these stories,” Wagener added. 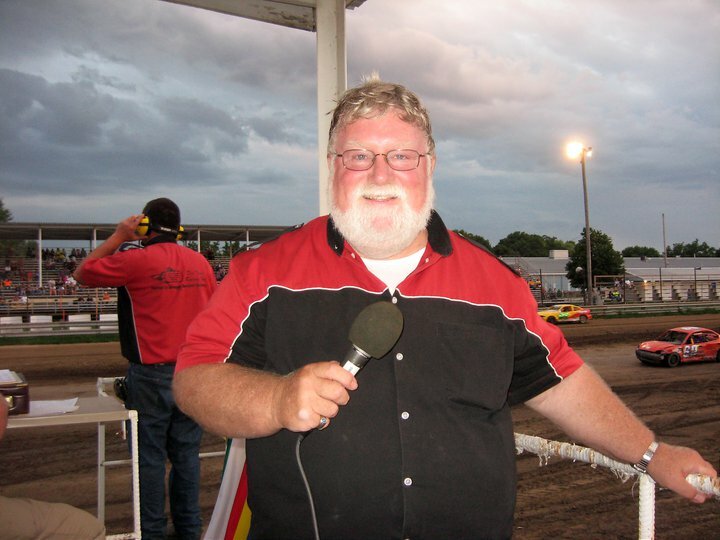 Maquoketa Sentinel-Press columnist Jack Marlowe wrote of me in his Jan. 24 “Sports Slants” column that “just hearing his voice made me feel comfortable at the speedway and helped me as a writer.